Somerville can be found just northwest of Boston. The area was once home to some of the earliest settlements of the Plymouth Pilgrims, along with surrounding communities of Medford and parts of Arlington. The town has played a role throughout the United States' rise to becoming a world superpower; even being the site of one of the first acts of war in the fight for America's independence against the British. After a slight decline during the post-war era, the Somerville real estate market underwent a dramatic rebirth that started in the 1980s and its potential has been fully realized in the past couple of years. Largely due to its award-winning community spirit and top amenities, modern day Somerville is a definitely cool place to be. Learn more about the homes and amenities in Somverville, MA below, or browse our listings for the area. Found a property you loved? You should definitely register with Hayden Rowe Properties. Signing up is simple, and by doing so you'll be able to use custom search tools, save your top listings for later, and receive notifications when homes that you'll adore come onto the Somerville real estate market. Occasionally referred to as “The City on Seven Hills,” Somerville real estate has been an investor and developer’s paradise for some time. Although the area still features many single-family detached homes, the area is undergoing a large amount of gentrification and many of these older homes are being destroyed to make room for higher density housing such as condos and townhomes. However, some older homes were left standing and converted into condo-style apartments. Many of these conversions can be found on the mid to low end of the Somerville real estate market. Somerville condos like these often have two bedrooms—although one bedrooms can also be found in the price range—and span across nearly 1,000 square feet. Recessed lighting, traditional bay windows, and fireplaces with mantles are some of the most cherished features of these particular Somerville homes for sale. For those that want a single-family detached home with character in Somerville will likely still be able to find a home. A home for sale in Somerville could potentially have manicured and mature lawns, modern renovations, and the home spans three or more floors with attic space. Due to the large gardens, some home owners have purchased their home and then applied for planning permission to subdivide their lot or created rental units to assist with their mortgage. If you ever struggle with what to do in Somerville, it will be due to the plethora of choices and not because of a lack of things to do. The area is filled with popular restaurants that feature menus with a diverse range of cuisines, microbreweries, bowling alleys, and of course, the infamous Museum of Bad Art. 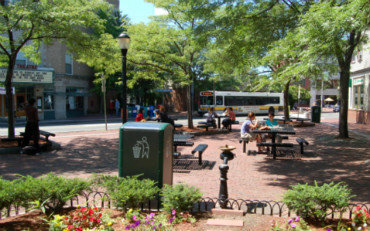 Although Somerville has many things going on throughout the community, it is Davis Square that is seen as the go-to district for those seeking a great time. Being home to some of Boston’s most popular dining spots, bars and coffee stores, it’s not difficult to see why Davis Square is such a thriving and vibrant spot. Situated on the Red Line, Somerville is also just 20 minutes by public transit to Boston’s South Station. With Boston’s Red Line running approximately every five minutes, and until at least midnight most days, purchasing a home in Somerville provides for a very easy commute to work in downtown Boston. When you’re ready to find your home in Somerville, or even sell your home in Somerville, contact the real estate specialists at Hayden Rowe Properties to assist you.